The exhibition was organised into 22 thematic sections (excluding the ‘Introduction’ and ‘Close’, surely not a coincidence? ), which examined “the major aesthetic and spiritual preoccupations of the twentieth century” (from the Press Release). In the third section, Les Grands Initiés (The Great Initiates) we find a familiar name: Aleister Crowley. He is in a good company; other names include Akseli Gallen-Kallela, Jean Delville, Charles Sellier, Paul Elie Ranson, Rudolf Steiner, André Bély, Piet Mondrian, Marcel Duchamp, Hugo Ball, Hilma af Klint, Usco, and Gino De Dominicis. The exhibition featured Aleister Crowley’s self-portrait from the 1920’s (24,2 x 19 cm, you can see the picture here) and four Thoth Tarot paintings; the Priestess, the Hermit, the Moon and the Aeon, each measuring 61 x 45 cm. Apparently the Thoth paintings were placed on the walls inside a white cubicle, where Kenneth Anger’s film “Lucifer Rising” was shown. It is likely that the paintings were missed by many people simply because of this ‘misplacement’. While I wasn’t able to visit the exhibition myself, I did get the Exhibition Catalogue (a small comfort), published by the Centre Pompidou. It’s an impressive work with 455 pages and around 400 images. Unfortunately it is entirely in French, so I’ll be working my way through it very slowly.. Information on Aleister Crowley is on page 100, with his self-portrait shown on the following page. The Thoth Tarot paintings are shown on page 344 (the scanned image at the top of this post), with Harry Smith’s version of the Tree of Life in the Four Worlds shown right next to them (my all-time favourite Tree of Life pic!). The Warburg Institute was still working on the restoration project of the Thoth paintings at the time of the Exhibition, but the four paintings displayed there were among the finished ones (notice the bright colours compared to the standard Thoth edition). 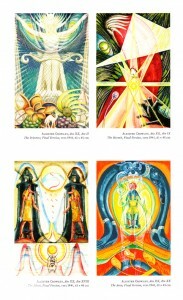 It is also these restored paintings that the Thoth Tarot Neuausgabe edition is based on. “Le dernier grand projet artistique qu’il réalise, dans les années 1938 – 1942, est la création de son jeu de tarot, “The Book of Thoth”. Il s’agit d’un nouveau jeu dans lequel la symbolique des cartes, tout en conservant la structure fondamentale des jeux traditionelles, est profondément renouvelée, sur la base de la doctrine magique de Crowley. Pendant la préparation du jeu, Crowley écrit aussi une monographie, où il présente son interprétation personnelle du tarot et explique la valeur symbolique de chaque carte (Master Therion [Aleister Crowley], 1944). Traces du Sacré was also exhibited in Munich, Germany, but without the Thoth paintings. This entry was posted in Tarot, Tarot History, Thoth Tarot / Aleister Crowley & Frieda Harris and tagged aleister crowley, art, book, frieda harris, history, painting, thoth tarot, traces du sacré, warburg institute. Bookmark the permalink. Buratti art did also an exhibition with the work from the Palermo Collection. The catalogue is in English.